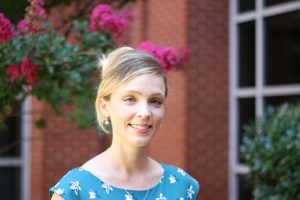 Emma Sophia Kay, a fourth-year PhD student in the UA School of Social Work, was recently selected as a 2017-2018 Social Work Health Care Education and Leadership (HEALS) Doctoral Fellow by the National Association of Social Work and Council on Social Work Education. Kay, of Huntsville, is one of five students nationally to receive the award. As a HEALS fellow, Kay will receive a $17,900 grant to fund her dissertation research, which is a study of the association between health care payer type and health among low-income people living with HIV. The grant also will offset research-related costs and help fund trips to present her findings. For her dissertation, Kay is analyzing the records of more than 3,000 HIV patients in Alabama, including basic clinical data, along with housing and education background gathered during standard assessments. Kay will study outcomes and quality of care and how it correlates to payer type, either through private insurance, federal or state subsidized services, like the Ryan White HIV/AIDS Program, or a combination of the three. “I hope that my study will contribute to our understanding of how U.S. health care policy shapes, and ultimately contributes to, the type and quality of care that people living with HIV are able to receive,” Kay said. Kay said the personal relationships she developed with clients during a field placement at an HIV clinic in Huntsville helped shift her focus from child welfare to working with people with HIV. She said she was surprised by the field’s spectrum of care, which included medical care, but also transportation and nutrition services. Kay credits Dr. Brenda Smith, associate professor and director of the PhD program for the School of Social Work, for encouraging her to purse a doctorate after completing her MSW degree at UA in 2014. Kay was a distance MSW student, and she and Smith had only met in-person a handful of times. But Smith was impressed with her writing, Kay said. Kay, who has also worked in hospice care and in Alzheimer’s care, hopes to work in health care policy or academia when she completes her dissertation in May 2018.